Plot: A boy growing up in Dublin during the 1980s escapes his strained family life by starting a band to impress the mysterious girl he likes. Starring: Ferdia Walsh-Peelo, Kelly Thornton, Maria Doyle Kennedy, Jack Reynor. 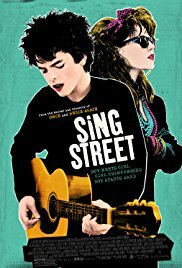 distributed by Weinstein Company «Sing Street» in the US movie theaters released on April 15, 2016 and has grossed over $14 million worldwide; dvd and blu-ray release date was set for July 26, 2016. Netflix dvd by mail rental date set for July 26, 2016. Redbox rental date is not announced. «Sing Street» in the UK released in movie theaters on May 20, 2016. The movie released on dvd and blu-ray on August 8, 2016.